This is an excellent article on the recent cave-in of the Canadian War Museum to the veteran's demands for a change to the wording of the bomber command exhibit. Due to certain computer problems there will be no updates on this blog for a week or two. Thank you for your patience, and please visit again. ~ I have added the blog of one Ben Reynolds to my sidebar. I went to high school with Ben and he recently moved to Ottawa. He's quite a talented illustrator - check out his artwork if you have the time. ~ Lately I have been biking to work. I really enjoy the exercise, but getting passed by all these men and women with calves the size of boulders is beginning to wear down my self esteem. ~ Laurianne's birthday is on Thursday. If you're from the Ottawa area, and you care about Laurianne, you can meet her at Yesterday's on Sparks Street for a drink and some snacks between five and seven. ~ If you are from the Ottawa area but can't make it on that particular day please refer to the bullet above. ~ If you are from the Ottawa area, but don't care about Laurianne, then you are excused from attending. ~ If you are not from the Ottawa area, but happen to be in the Ottawa area on that particular day, you are welcome to drop by. ~ If you are from Russell, you can come too. ~ We recently watched Disturbia, a remake of Hitchcock's classic Rear Window. Usually remakes of classic movies are very very bad, because remaking classic cinema is pretty pointless - sort of like trying to redoVan Gogh's Starry Night. This movie, however, was different enough from the original that it worked . . . somewhat. Although lacking in the flair and subtleties of the original, it was mildly entertaining. ~ We also watched Hot Fuzz which is send-up satire of old cop movies and shows. It's a bit over-the-top bloody, but overall it is quite funny and enjoyable. ~ I've taken to reviewing movies on facebook. I'm fairly harsh and pretty economical with my stars - but only because it's more entertaining for me that way. ~ I should note that the bikers who pass me are passing me on road bikes. I'm on a mountain bike. My only advantage would be if we hit some rough mountain terrain. Unfortunately, there are no mountains between my home and my place of work. ~ If you have time, check out Dave Beldman's continuing guide to reading Job and his insightful analysis of new insights into DaVinci's Last Supper. ~ Actually, I'm kind of glad that there are no mountains between my home and my place of work. ~ Someone is knocking on my ceiling. Well, I guess they're knocking on their floor and I'm hearing it through my ceiling. ~ Alright, they stopped now. ~ I have twice come across books claiming that Ring around the Rosie originates from the period of the Black Death. However, the words of that rhyme were not written down until some time in the nineteenth century. The words seem to fit so well. Although, apparently there was no sneezing involved in the bubonic plague. Maybe the rhyme was written about the plague afterwards. It's hard to believe that it would remain unwritten for some four hundred years. ~ My cousin Jon Barnhoorn, his wife, Janice, and their two children, Stephen and Samuel, will be heading to Nigeria very soon for translation work with Wycliffe ministries. Please keep them in your prayers. Robert Nesta Marley, and the original Wailers sing the famous love song from the amazing Catch a Fire album. Peter Tosh, the six foot six towering bundle of cantankerousness, and Bob's childhood friend, Bunny Wailer, were still part of the band at this point. Marley, a recent Rastafarian convert is beginning to grow his dreads, Tosh is wearing the knitted woolen cap with the Rasta tri-colours ,and Bunny Wailer is wearing the fez. Their vocals mixed quite well. Benny Hinn is the white-suited tan gentleman with a sweeping wave of grey hair who can be seen plying his trade on his show, This is Your Day! The controversial preacher is noted for his pleasant voice, dramatic spiritual theatrics, and his claim to have a direct connection to God. To some he merely seems strange, while to other he is a modern-day God-infused prophet. Hinn's life, as he tells it, is a confusing and inconsistent tale. He was born Toufik Bendictus Hinn in 1953 in Israel to a Greek father and an Armenian mother (that's Armenian, not Arminian). In his home they primarily spoke Arabic. He was raised as a Greek Orthodox Christian and attended a Roman Catholic School. Hinn has claimed that his father was mayor of Jaffa. The truth, however, is that his father was a clerk at an Arab law office. In fact, there was no mayor of Jaffa by the name of Hinn, ever. After 1948, Jaffa did not exist as it was amalgamated with Tel Aviv. Hinn's father, a Palestinian, would not have been elected mayor of a largely Jewish Tel-Aviv-Jaffa. All of the city's mayors from 1936 onwards were Jewish men whose names were certainly not Constandi Hinn. Hinn now claims that his father was not a mayor, but merely carried out some of the functions of a mayor as a liaison between the Israeli government and the Arab community. These claims have not been substantiated, but do smell of self-aggrandizement. Hinn claimed to have grown up in a spacious house in the suburb, but he actually grew up in the basement of a Greek Orthodox Church. He claimed to be both a self-conscious stutterer and an extroverted showman in his youth. 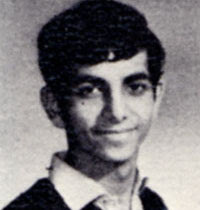 He claimed to be a high school graduate when records reveal that he dropped out. Hinn has three or four separate stories about his own conversion and at least two versions of the story of his family's conversion. It is abundantly clear that Hinn has no desire for an honest recounting of his past. Instead, Hinn is content to build up a hagiographic mythology about himself with little regard for truth or honesty. This would just be an unfortunate matter of personal dishonesty if it were not for the fact that Hinn makes his opulent living from being an evangelist. Hinn applies his fondness for stretching and inventing the truth to the Gospel. Any time an individual opens their mouth to say that they have a fresh new revelation from God relating to theology, one should exercise caution. Chances are, this person is just recycling age-old heresies. Hinn has taught that each person of the trinity has a separate trinity within itself, making a nine-person Godhead. Each person of the trinity, Hinn claimed, is a trinity. Hinn later apologized for saying this, but still claimed that each person of the Godhead possessed his own body, spirit, and soul. Unfortunately, this is not much better. This heresy is called Tritheism and denies the unity of the Godhead. This is not a new heresy as it is a basic misunderstanding of the trinity that has been taught since at least the latter half of the sixth century. This teaching makes Christianity into a polytheistic three-god religion. Christianity is monotheistic and, although the trinity is beyond human comprehension, it is clear that the trinity does not describe three separate entities. No, there are three persons in one indivisible God. Among other things, Hinn has taught the following: that Jesus became sin and took on the nature of Satan when he was on the cross, that Hinn spoke with Katherine Kuhlman despite her being dead, that Christ was only blameless because he had the Holy Spirit, that Adam could fly, that Adam landed on the moon, that those who speak against his ministry are cursed (no worries here, mate), that critics of ministers would get sick, and that dead people watching his program (don't ask how) would be raised. Hinn has also taught that each human being is a God-man. He claims that we are "samples of Jesus" and "little gods on the earth." Hinn claims further, through a little bit of bizarre etymological tap-dancing, that when we call ourselves Christians we "are saying 'I am a messiah' in Hebrew. I am a little messiah walking on earth." In making this claim, Hinn has blurred the line between humans as created beings and God as the Almighty Creator of the universe. Rather than bowing before his incomprehensible might, a God-man Christian would merely respectfully nod to a God who is, after all, his superior. Humans are created in God's image, but we are not little versions of God. We are like him, but we are not him. We are nothing compared to his glory. Related to this teaching of man's deity is Hinn's teaching of the health and wealth gospel. Since each person is a God-man, then each person's words have a similar power to God's creating and upholding word. Thus, if a Christian, in faith, says they are rich and do not have cancer, then -by golly!- they are a wealthy cancer-free individual. In the same way, if a Christian says something like, "Ugh, I hab a cold," then this is a negative confession. A true Christian must make positive confessions by saying such things as, "Ugh, I do not hab a cold." In that way, through the power of words, the cold would disappear (probably within 24 hours). Our words are pale shadows of fragility when compared to the unchanging and all-powerful words of the Almighty. Our words fall weakly from our lips while God's words uphold the very fabric of the universe. While our words have power to wound and build up both ourselves and others, they do not have the power to create or alter realities. There is only room for one God, not a pantheon of duelling gods. We can only humbly make our requests to God, not demand his action. It follows from Hinn's teaching of the power of a Christian's words, that, by claiming healing, a Christian can be completely restored. This healing is, in fact, a major part of Hinn's performance. If one observes Hinn's crusades, one can see the obviously handicapped, the paralyzed, the blind, and other visibly handicapped individuals shuffled off to one side. Meanwhile, individuals whose afflictions are not so visible are ushered to the front. The ushers are supposedly rooting out the genuine seekers from the non-genuine, but really they're picking out the sickies that will make the best show. Often people with slight walking problems are given wheelchairs "to rest in" only to miraculously walk later on. Whenever Hinn's ministry is asked to substantiate claims of healing, it inevitably fails to produce even one example of miraculous healing. Often on-stage healings are the manifestation of the extreme spiritual high that Christians receive at Hinn's meetings. Symptoms dissipate temporarily while the actual problems remain. Dr. William Nolen in his book Healing: A Doctor in Search of a Miracle, writes of a Katherine Kuhlman service he attended in the seventies. Of the twenty-five people who were supposedly healed, not one of them actually improved. In an extreme and saddening example, a woman who had been urged to throw away her braces and run across the stage had her backbone collapse the next day. Four months later she died. Kuhlman is notable as the charismatic faith-healer that Hinn has modeled himself after. 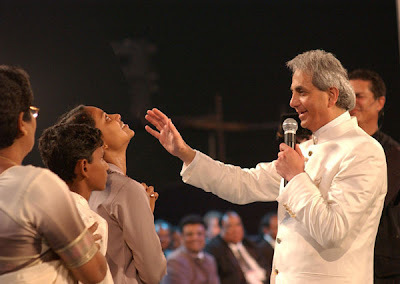 It is entirely possible for someone to be healed at a Benny Hinn crusade. However, it would be a case of God acting despite Benny Hinn, not because of him. The easy excuse for faith healers is that the healing of each person depends upon that person's faith. Therefore, if the person lacks faith then there is no healing. The blame is shifted directly to the afflicted person. Hinn has acknowledged in interviews that not everyone is healed at his services. Of course, the words that come out of his mouth on his program tell a different story. Hinn consistently offers the false hope of miracle cures that can be accessed by faith through sowing the seeds of donation. After all, Hinn needs his private jet, swanky getaways, and five-star service. Hinn is a proponent of the so-called prosperity gospel. According to this teaching, Christians merely have to give in faith and they will receive back one hundredfold. At the root of this errant teaching is fundamental misunderstanding of the nature of faith. Prosperity gospel followers believe that faith is a substance that humans work up inside themselves which allows them to alter reality. However, faith is not something that people create, it is only granted to believers by the grace of God. Faith is the gift of God and is not spontaneously self-manifested by some kind of Christian superpower. There is absolutely no Biblical call for Christians to have faith in Extra-Biblical concepts such as the name-it, claim it gospel. God is sovereign and he will not surrender his sovereignty to any human no matter how sincerely that person believes they have worked their faith up to dizzying heights of glory. Followers of this teaching often defend it by asking the rhetorical question, "did Jesus die so we could be weak and poor or so that we could be healthy and rich?" In fact, this question raises a false dichotomy. Jesus died to take away the sin of the world, to redeem the world from sin. Jesus died to save us from our sins, not to ensure our pockets are overflowing and our health is always perfect. The prosperity gospel forgets that Jesus' death, while a final victory, has not yet been consummated in a final removal of sin from the earth. The victory has been won, but consummation of this victory has yet to happen. This is why poverty, war, sickness, and all the other horrible results of sin remain. One of the most pathetic things about the prosperity gospel is the implication that faithful Christians who are poor, afflicted, sick, or persecuted are not walking in obedience to God. If poverty is a curse of disobedience, then the Bible would reflect the mentality that the rich are the most faithful Christians while the poor are the least faithful. The Scriptures, in fact, tell just the opposite tale. Christians are urged not to show favouritism to the rich, but to embrace all brothers and sisters regardless of wealth. When early church members gave up large portions of their wealth to the church, it is not with the understanding of a huge financial return. The gifts are given out of humble service to God. There is no indication that any of these donors became richer after their act of charity. Interestingly enough, Hinn is always the one asking for money from his viewers. According to his teaching, just sending a donation to his ministry will bring in vast financial rewards to his viewers. By the same token, if he were to give money to his viewers, he would also be blessed. If he would only step out in faith and sow a seed into his viewers' lives, imagine how much he would be blessed! In fact, his ministry shouldn't need donations if the prosperity gospel is true. He merely needs to send money to various churches and charitable causes, and the money will spontaneously come pouring back to him. For prosperity gospel adherents, Biblical passages which speak of blessings are inevitably twisted into passages which speak about material blessing. This is basically American materialism awkwardly jammed into Scriptural mold. There is a stunning difference between prosperity and having one's needs provided, and wasteful and decadent living. How can any conscionable Christian drive an $80,000 dollar luxury vehicle while there are men and women around the world without food? Children are going hungry in the very cities that these mega-churches are built in, and yet there are no programs in place to feed, clothe, and care for these needy. After all, the prosperity gospellers argue, the poor just need to adopt the health and wealth gospel and they'll flourish. What happened to mercy and compassion? What happened to the example of Christ who cared for the poor? Hinn's own life is filled with extravagance. Although Hinn refuses to reveal his ministry's accounting, Benny Hinn's ministry takes in an estimated revenue of $100 million per year. Hinn's personal salary is as much as $1 million per year. In addition, he receives royalties from his best-selling books. Hinn's own ministry snaps up many of the books, and Hinn collects the royalties on these sales. Hinn also has plenty of job perks. His company purchased his $3.5 million home as his parsonage, a business expense. Using his multi-million dollar personal jet, Hinn travels the world in luxury. While travelling to and from his crusades, Hinn makes expensive stopovers at luxurious resorts for relaxation. This is charged to his ministry. Even while at his crusades, Hinn only stays at the most expensive five-star hotels with his entourage. Donations are being spent on decadent luxuries, and former employees charge that cash donations are being syphoned off. Clearly, this is not a Christian model of proper financial stewardship. I am not arguing that God does not bless Christians. I believe that God does bless Christians, and that sometimes these blessings are related to health and finances. However, it is not as simple as ordering these blessings out of the sky. Every human is given a certain amount of blessings, and every human is given a certain amount of suffering (never more than we can bear). God certainly blesses us with health, money, and success; however, these blessings are not guarantees. Christians who believe that these blessings are guarantees will never be able to withstand direct persecution and will continue to be poor communicators of the gospel. When a Pakistani church is burned down are the congregants to believe that it is due to their lack of faith? If a devout person's family is wiped out by hunger, war, or disease is he to believe it is because he was not "walking in God's promises"? These questions don't merely address the nature of faith but they speak to the very nature of suffering and pierce straight down into the gospel itself. Did Jesus die so that we could be rich and healthy? Is suffering just a result of unfaithfulness? Several months ago I watched a film about the Rwandan genocide called "Shooting Dogs." In this film, John Hurt plays a Catholic priest at a school in the midst of the 1994 genocide. One particular line he uttered stuck with me. The Belgian UN forces at the school have announced they were pulling out. Hurt's character decides to stay with the Tutsi refugees as Interhamwe militia mill menacingly nearby. At this time, he says to another character (and I am paraphrasing) : "All this time I have been searching for God and I found him here. He's right here suffering with these people . . ." An incredible thing about God is that we often sense him closest when we are most vulnerable, when we are face to face with the enormity of humanity's evil. Not only is this embarrassing, sad, and shameful, but it is also unBiblical. The passage that untouchable holy-men such as Hinn quote is Psalm 105:15 which says, "Touch not mine anointed, and do my prophets no harm" (KJV). Benny Hinn and his ilk would have gullible Christians believe that this passage means that those who claim to have direct anointing from God should not be criticized. In reality, the anointed in this passage are not the televangelists, but the Israelite kings and patriarchs. The passage is a command not to physically harm kings or prophets. It is not a carte blanche for leaders to act as infallible interpreters of God's will and teaching. Christians are called to be accountable to one another and this is especially true for leaders. If Christians were not permitted to criticize men claiming to have God's revelation, then Christianity would just be a milky stew of half-cooked philosophies, warmed-over Unitarianism, and bits and pieces from the fertile imaginations of religious con-men like Benny Hinn. Accountability is what makes the church strong. Without accountability, entire congregations are misled and taken advantage of. Church politics can certainly be ugly, but not as ugly cult-like devotion to one man. A little accountability goes a long way. Claims to be receiving the truth via a direct line to God should be treated skeptically. Gnosticism simplified, is a belief system whereby special revealed knowledge is revealed only to a specially-attuned elite. Hinn has repeatedly made the claim, as many charismatic evangelical preachers do, of having received special revelation from God. However, if one examines his claims carefully, Hinn comes out looking like a two-bit circus psychic. Hinn prophesied that Fidel Castro would die in the nineties, that the entire homosexual community of North America would be destroyed by fire by the mid-nineties, that Jesus would appear physically at one of his Crusades in Nairobi, and that a great event would occur on approximately April 15th 2003 in Israel. None of these prophecies came true. There are a number of possibilities here. Three immediately occur to me. First, God was mistaken when he told Hinn these things. Second, Hinn misheard God. Third, Hinn never heard from God and merely made up these predictions. The first possibility would mean that God is not omniscient. The second possibility would mean that God was unaware that Hinn might misunderstand him which, in turn, would mean that he is not omniscient. The third possibility is the most likely, as it becomes not the fumbles or mistakes of a pure and inerrant God, but the deception of a religious con-man. Even one false prophecy from a man who claims to be hearing directly from God is enough to dismiss him as a liar. 1) The Godfather - the final assassinations of all the Corleone enemies juxtaposed with the baptism of Michael Corleone's godson. "So what, you like the mafia or something?" "Well, the godfather movies sort of have you rooting for the bad guys, don't they?" "So how do you justify yourself?" "Isn't that from Donnie Brasco?" "Do they even say that in the Godfather?" "You should have said something about making me an offer I can't refuse if I shut it"
2) Platoon - The sequence, largely shot from above, of Sgt. Elias Grodin, stumbling out of the forest surrounded by Viet Cong and, with arms upraised, finally succumbing to the bullets as the helicopter flies right over top of him. "Actually John, that sounds disturbing." "Then why do you like it?" "Isn't it also a little bit of pedagogical propaganda? After all, this is Oliver Stone." "Whether you agree with him or not, the movie portrays the ennui, madness, and terror of war quite well." "Ooooh, ennui, what are you some kind of intellectual?" "Then stop using that word." 3) Dead Poets Society - The sequence where many of the students stand on their desks and say, "Oh Captain, my captain" to the departing Mr. Keating. 4) City of God - The opening sequence where Lil' Ze and his gang are chasing the chicken through the bustling, energetic streets of Rio de Janeiro's slum and then come across Rocket with his camera. "Why do you enjoy movies that glorify crime and violence?" "I don't believe crime or violence is glorified in this film. In fact, I find their portrayal quite disturbing." "Why do you like disturbing things?" "What are you, some kind of thinker?" "What did I say about posing as an intellectual?" 5) Amistad - The powerful scene where Cinque jumps overboard after the Amistad is captured and swims desperately towards the rising sun. "That movie is not great." "I'm just talking about that particular sequence." 6) Hero - The amazing dual between Nameless and Broken Sword over top of a serene mountain lake. The colours in this movie are absolutely breath-taking. "That movie is like one long Kodak commercial with a heavy dose of Chinese nationalism." "But the cinematography is beautiful." "Birth of a Nation also had good cinematography for its time." "I don't think you can compare a movie glorifying the KKK with a movie that promotes the idea of a unified China." 7) Mystic River - The scene interspersing Dave's forced false confession with the actual events that led to him being covered in blood and with Brenden's confrontation of his brother. "The tension in this scene is palpable." 8) Lawrence of Arabia - The scene in which an Arab has fallen off of his camel and is trudging through the blazing hot desert. The desert is simply striking and the figure of the Arab looks so forlorn. "Trudge rhymes with drudge, you know." "Yawn rhymes with moron, you know." "Yeah, but the words don't match rhythmically." 9) The Godfather Part II - The juxtaposition of the religous parade with Vito Corleone's assassination of Ciccio/ or --- The last scene where Michael Corleone's loss of his soul is shown in the murder of Fredo contrasted with the young alienated Michael before the war. "Choose one or the other, you indecisive flip-flopper." 10) Last of the Mohicans - The final sequence, set to the music of Clannad, in which Uncas dies fighting for Alice, Alice commits suicide, and Chingachgook avenges his son's death. This is all ended of course with this speech: "Welcome him and let him take his place at the council fire of my people. He is Uncas, my son. Tell them to be patient and ask death for speed; for they are all there but one - I, Chingachgook - Last of the Mohicans." "Do you like the sequence or the quote?" "You know the movie barely even resembles the book." "That entire scene is Hollywood-inspired ludicrity."